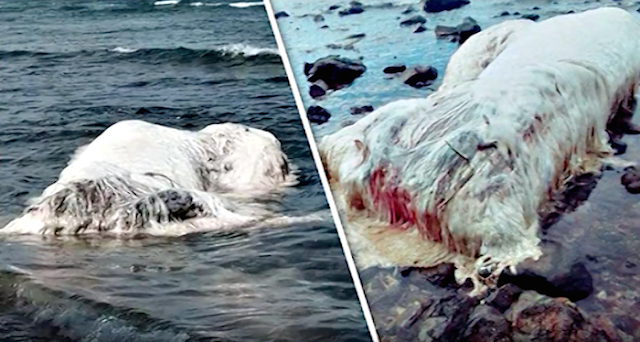 UFO SIGHTINGS DAILY: 40 Foot Hairy Sea Creature Found On Coastal Shores Of Philippines, Video, UFO Sighting News. 40 Foot Hairy Sea Creature Found On Coastal Shores Of Philippines, Video, UFO Sighting News. This alien creature was discovered on the coast of the Philippines this week. Its 20 foot size is baffling scientists since there are not 6 meter creatures that have white hair...but since this creature was bitten in half, its full size could be 12 meters or 40 feet! Yes I call that an alien, because no such animal could ever exist on Earth that size without being noticed in the last thousand years. It could be an alien visitor that was amphibious living on both land and water, but didn't account of the dangerous sharks and whales in the area. Or worse yet, it was killed by another of its own kind. The 20ft long beast is covered in what looks like thick white fur, prompting some to liken it to the Yeti or Abominable Snowman. The beast washed up on the shores of the Philippine’s Dinagat Islands on Sunday, on Cagdainao beach. Residents and tourists alike have flocked to the site to gawk at the incredible sight with some snapping selfies with the creature as it went viral online. Several suggestions have been put forward as to what the beast may be, with one twitter user, John Paul Garcia, saying: “Globster/Trunko right? Half whale half polar bear?” (more at source).